Best Online Source for Secondhand Antiquarian Books on Painting, Sculpture. Free Delivery Around the World.  What are Antiquarian Books? Are They the Same as Rare Books?  So What Makes an Antiquarian Art Book Valuable?  How To Find Antiquarian and Rare Art Books on the Internet? With book publishers coming under increasing pressure to reduce costs, fewer art books are being republished. Worst hit are monographs of Old Masters, and scholarly books on art movements, styles and schools. At the same time, English translations of high quality titles are becoming less and less frequent. As a result, with so many scholarly works now out of print, secondhand book dealers are usually the only source for such titles. But sourcing good quality Antiquarian or old secondhand art books is not easy. Many online dealers offer insufficient information about titles in stock, and postage rates can be prohibitive. As well as this, not all rare book dealers are sufficiently pro-active in seeking and acquiring quality collections. As a website devoted to visual art, we are constantly searching for detailed information about painters and sculptors throughout the ages, and our favourite rare book dealer is the Time Traveller's Bookshop. What are Antiquarian Books? Are They the Same as Rare Books? First, let's deal with the question of terminology. What is an antiquarian book? In fact, what is the difference between a rare book and an antiquarian book? These two rather vague terms are often used interchangeably, but their meanings are subtly different. An antiquarian book is an "old" book whose value stems from its early printing date, together with its general rarity, historical interest and the like. It is almost certain to be scondhand. However, a book does not need to be commercially valuable, in order to be labelled "antiquarian." By contrast, the term "rare book" carries the clear suggestion of commercial value. Furthermore, a "rare book" does not need to be old - it might be relatively or even brand new - it simply needs to have "rare" attributes. So What Makes an Antiquarian Art Book Valuable? 1. Limited Print Run. The total number of printed copies must be relatively small. The Der Blaue Reiter Almanach (1912), for instance, would be an ideal instance of this. However, being from a limited print-run alone, may be insufficient to create value. A self-published volume of watercolours, for instance, may be in exceedingly short supply, but still have no value. 2. Special Edition. The book may be a specially produced edition. First editions are usually the most valuable, but first translations, or specially amended versions may also be highly valued. Alternatively, it may be a specially illustrated edition with illustrations by a famous painter, like the 1916 edition of Hans Christian Andersen's Fairy Tales, published by Harrap and illustrated by the Irish virtuoso Harry Clarke (18891931); or the 1857 edition of Poems by Alfred Lord Tennyson, illustrated by the Romantic painter John Everett Millais (1829-96); or Alice's Adventures in Wonderland (1907), illustrated by Arthur Rackham (1867-1939). 3. Print Materials Used. An edition may be highly prized by collectors because of its characteristics as a physical object. For example, it may be printed on valuable type of paper or other material. Books on Chinese art and calligraphy, for instance, have been printed on silk, while nearly all books produced prior to 1450 were inscribed onto vellum. Less often, a secondhand book may command a high price because of its (miniature or exotic) format, or pop-up content. 4. Added Value. Almost any object may have value "added" to it, and books are no exception. Thus for instance, a mass-produced, secondhand book on Installation Art, published in 1995, which would normally be worth (say) $2.00, might be worth a hundred times more if it contained the signature of a famous modern artist such as Damien Hirst. A copy of the exhibition program to the Armory Show (1913) in New York, autographed and inscribed by the avant-garde artist Marcel Duchamp (1887-1968) might be worth a six-figure sum. 5. Physical Condition. While insufficient by itself to add rarity or intrinsic value to an art book, its physical condition - especially the quality of its colour plates, illuminations or illustrations - may be crucial to its value. All rare antiquarian books must fulfill at least one of these five criteria: some may satisfy several. How To Find Antiquarian and Rare Art Books on the Internet? Enter a topic, author or Keyword and the search-engine runs a combined search of all book-related websites. You can further refine these searches by using the more advanced options provided. Even better, you can buy most of the books directly from the booksellers. Let's say for example you found a result of a search for a rare monograph on Picasso, with an original lithograph. At "Vialibri" and "Addall", they will most likely show the results of listings at Amazon, Abebooks and Choosebooks, but in many cases you can also see the very same book offered "Direct from Bookseller". The link "Direct from Bookseller" will take you straight to the booksellers' website, which is often your friendliest and best option. 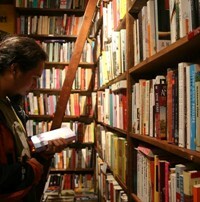 For details of our favourite online dealer, see: Time Traveller's Bookshop. There are two potential problems when buying rare secondhand art books online. To begin with, not all websites provide sufficient information about the items in their rare books catalogue. Also, websites have been known to list books as available, when in fact they are not in stock at all. Bottom line: ideally, shop around until you find a reliable dealer. He/she will be worth their weight in gold. Nearly all websites dealing in antiquarian art books charge for shipping. This can be expensive. Bottom line: find a reliable dealer who doesn't charge for shipping. See, for instance, Time Traveller's Bookshop. Since approximately 1996, thousands of specialist antiquarian bookdealers worldwide are offering rare art books online. 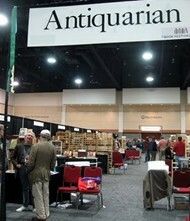 Some antiquarian bookdealers are part of larger trade associations, like the International League of Antiquarian Booksellers (ILAB) (website: ilab.org) or the International Online Booksellers Association (IOBA) (website: ioba.org), but there are also numerous independent booksellers who are selling the same books and offer a similar service. Dealing with members of bookseller-organizations or professional booksellers - rather than private individuals selling secondhand art books on eBay or elsewhere - does not guarantee quality of descriptions or fair trade, but it does help you to establish a commercial relationship in the market, which may be valuable in the long run. Furthermore, a minimum of common sense can help you to determine the professionalism of a dealer: look at their websites and their book descriptions; don't be afraid to ask a few questions by email; and you should get a feel for the service they offer. (1) It has a wide and highly informative online catalogue of out-of-print and antiquarian art books. (2) It offers worldwide FREE shipping on any item. Furthermore, the firm has good contacts with important book dealers around the world and regularly obtains art books from private collections of serious collectors, scholars and booksellers, located mostly around the most important universities in North America and Britain. For more, see: Time Traveller's Bookshop and Gallery. Need information about who publishes the best art books? See below for a list of book publishers, in Europe, America and worldwide, specializing in all types of art, notably fine art. Publications include all subject areas, including monographs on the world's greatest visual artists, history of art movements, as well as reference works on: painting, sculpture, architecture, photography, crafts, design, illustration, aesthetics, museum exhibitions and collections, objets d'art, and more. Plus learn-how-to books on drawing, colour charts, mixing colours, linear perspective, oils, watercolours and acrylics, for children and adults. See also: Best Art Schools. Art Publications: Art and photography books. See also: Greatest Photographers (1880-present). Reference books on painting, sculpture, objets d'art. Architecture, landscape, urban design; history, contemporary projects. Fine and applied arts, architecture, design, photography, graphics. Catalogues on visual arts, architecture, photography, including British and foreign museum collections. Books on visual arts, including textiles, conservation, architecture, paintings, decorative arts, photography and drawings, sculpture, and history of culture. Illustrated books on art, contemporary design history, with an emphasis on Asia. Contemporary artists books on well established, and new and emerging painters, sculptors and others. Illustrated books on international fine art, plus museum books. Range of museum-linked art, archeology and cultural publications. Contemporary art including land art, art history, decorative art, collecting, cinematography and architecture. Books on fine art, architecture, literature, history, and biography. Illustrated books on interior design, decorating, crafts. Books on photography, crafts, art, home decorating, needlecrafts. Topics published include: art, architecture, animation, film and visual culture. Books on art, craft, design, architecture, in English, on Japan and S.E. Asia. Topics published include: Islamic art and culture, including architecture. Graphic design, contemporary architecture fashion, product design, art and the humanities. Topics published include: art and visual culture. Fine art, decorative art, photography, architecture and design. Also publishes in conjunction with museums and galleries. Books on visual arts, architecture, fine art photography, design. The NGS publishing department creates high quality art and photography books in support of exhibitions and its permanent collection. Publishes books relating to the permanent collection and exhibition program. Fine art, photography, biography and history. One of the world's best publishers of books on the visual arts including all areas of painting, sculpture, contemporary artworks, art history, artist monographs, biographies and historical movements. Excellent volumes on Northern Renaissance art (1400-1600) and Italian High Renaissance painting. Topics published include: Everyone's Guide to... art book series, featuring drawing/sketching, watercolours, oils, acrylic painting, landscape pictures, portraits. Illustrated art books, museum guides, exhibiton catalogues, reference books, biographies/ monographs for art historians and collectors of works of art and objets d'art. Topics published include: Fine and decorative arts, architecture, design, photography. Fine arts, design, architecture, cinematography, cultural studies. Illustrated books on the art, culture and history of Southeast Asia, notably Thailand. London, United Kingdom - see also: Royal College of Art. Art books, international exhibition catalogues on all aspects of fine art. Royal Collection Publications produces books and catalogues of the British Royal Art Collection and the royal palaces. Illustrated books on the arts, architecture, art history. Books on Czech and Slovakian art, artifacts, ojects d'art. Books on wood carving and woodworking skills for the professional craftsman and hobbyists. General art books, exhibition catalogues and gallery guides in the area of contemporary art and British art since 1500. One of the world's most eminent art book publishers. Covers all aspects of art history, international and national painting movements, Old Masters, contemporary painters and sculptors, representational and abstract art, architecture, design and crafts from around the globe. Award-winning photography and art books. Popular and academic books on fine and decorative arts, architecture and photography. See also: Victoria and Albert Museum. Illustrated books on interior design, art, and architecture. Architecture, decorative art and design. Illustrated books on Indian art and culture. Academic and general interest books in the humanities and social sciences, including art and architecture. For up to date news, see: Art News Headlines. Classical, Pre-historical and Christian archeology, books on Egyptian art, other types of ancient art, numismatics and epigraphy. Books on visual arts, architects and artists. Topics published include: Art books, nature books, and children's books, illustrated by famous painters. Books about fine art, artists, architecture. Visual arts, particularly artistic photography, and contemporary folk art. Specialises in books on the works of great painters from 17th-20th century. Modern and contemporary culture, including computer art. Graphic art, crafts and hobbies. History of painting/sculpture, architecture, decorative arts. Painting, sculpture, ceramics, porcelain, antiquities, archeology. The Rodin Museum publishes up-to-date works and catalogues on the sculptures and work of Auguste Rodin. History of art, biographies of artists. Illustrated books on photography, visual arts and artists. Architecture, design, art and photography. Photographic works, modern and contemporary art, architecture. Books on painting, architecture, sculpture. Design, fine art, architecture, book illustration. Original graphic books, artistic collections. Illustrated books on art, cultural history. One of the world's leading producer's of fine art books. Covers everything from prehistoric art, to Greek sculpture, Roman reliefs, Byzantine iconography, Italian Renaissance art, Baroque, Rococo, and Neoclassical eras. Also covers the modern era of painting and sculpture, including Impressionism, Expressionism, Cubism, Dada, Surrealism and Pop art, along with avant-garde contemporary artworks from around the world. Archeology, Greek art and civilization. Including monographs, and exhibition catalogues. Illustrated books on art, archeology, architecture, interior design, history and Greek sculpture. Illustrated non-fiction books on cultural history, archeology, and art. Illustrated books on art, architecture, photography. Focuses on 20th century art. Large-size photo books, books on architecture. Contemporary visual art, including artists books, monographs, exhibition catalogues. Illustrated reference and how-to books on art techniques (painting, drawing, sketching), crafts, stained glass, wood-carving, origami, photography. Modern and contemporary art books, artists, monographs, biographies. Books on Italian art, architecture and religious art. Illustrated books on fine art, archeology, architecture. Books on architecture, catalogues of exhibitions, Vatican museums and galleries. Monographs, exhibition catalogues on art, architecture, design, photography, archeology and art theory. Specializes in writings by Leonardo Da Vinci. Specializes in illustrations of archeological sites. Academic and trade publisher of books on art history, film and cultural studies. Books on art, culture, architecture. Books and catalogues on contemporary architecture, art, design, photography, and film. Publications on architecture, town planning, modern art and design. Contemporary art, photography, architecture, design, and typography. Theory, monographs, critique. Artists books by young emerging artists. Illustrated books on art and cultural heritage, liaising with the best Polish artists and museums. Illustrated books on Russian Medieval painting and modern culture: including collections, museums, exhibitions. Published range includes illustrated books on art. Monographs and illustrated collections of medieval Russian art, architecture, Christian antiquities, metalwork, costumes, icons and iconography. Also publishes numerous fine art books, notably studies of Gothic architecture. Architecture, graphic design, and contemporary art, focusing on works by established and emerging architects, designers, and photographers. Art, architecture, archeology, design, catalogues of exhibitions, museums and galleries. Fascimile Medieval and renaissance manuscripts, reference and fine art books. Monsa Publications Instituto Monsa de Ediciones, S.A. Architecture, art, design and graphic design. Contemporary art, artists' books/writings, anthologies of avant-garde styles, exhibition catalogues. Art, photography, architecture, documentary literature on 20th and 21st century art. Exhibition catalogues and monographs on world art (Islamic countries, India, China, Japan, Africa, Oceanic art, ancient Americas). Rare academic books in the area of fine arts, covering all periods/movements, from 16th-century architectural treatises to modern artworks and artists of the avant-garde. Contemporary handmade artists books by acclaimed artists including Chuck Close, Stephen Dupont, Veronika Schapers, Organik, and Christopher Wilde. Fine art, graphic design (pictorial archive and clip art), crafts, architecture. Illustrated books on photography, architecture, design, and the fine arts. Practical art and fantasy drawing instruction, crafts, woodworking, scrapbooking, and graphic design. Books on Greek and Roman sculpture, European paintings, drawings, photography, the history of art, and art documentation research. Art and art history, photography, design, architecture, fine and decorative arts. Fine art, architecture, photography and decorative arts. Books on architecture, design, ornaments, photography, typography. Illustrated books about photography, art, design. Produces academic and general fine art publications about The Metropolitan Museum of Art permanent collection, including American Indian art from Neolithic times onwards. Also publishes exhibition catalogs and children's books. Academic and scholarly books in subject areas like art and architecture. Illustrated hardback and paperback books on art, architecture, decorative arts, photography, landscape, urbanism, and graphic design. Produces books and catalogs on art, architecture, design, photography, and film. Range of fine art books. Publishes academic books on topics including art history. Books on the performing arts. Fine and decorative arts, architecture, design, photography. Books on the arts of Tibet, the Himalayas and Central Asia; also, monographs on the history of Asian art, plus museum and exhibition catalogues. Wide range of academic subjects including art and architecture. Specializes in "how to" drawing and painting books. Illustrated instructional and reference books for adults and children on art, craft, photography, performing and visual arts, architecture and interior design. Scholarly and general interest books in the humanities, particularly art and architecture. Books on Islamic culture and civilization. Publishers of book and exhibitions catalogues relating to archeology, judaica and Jewish art. Books on art and architecture of India. Visual art, design and photography. Books on design, art, architecture, photography, manga techniques and Japanese culture. Illustrated books on art from India, culture, history, architecture, photography, and crafts; catalogues and regerence works for art galleries and museums. Graphic design, visual art, photography, Japanese art and culture. Art/graphic books on Asian civilization, culture and philosophy. Design, graphic arts and illustration books.  For more about rare art books, secondhand or new, see: Homepage.